What is a digital attitude and why do you need one now? This was a marketing conference, and they were talking about marketing executives, but this could just as easily apply to any business, entrepreneur, consultant, or not-for-profit operating in the world today: if you don’t understand the paradigm shift that the web represents in the way we communicate, educate, entertain, and do business; if it’s not “in your blood” as Kaushik states, you will have a very hard time communicating, educating, entertaining, or doing any kind of business in this new world. You need to learn to imagine the possibilities. Joel calls this a “Digital-First Posture” and his book is a strong call to action for businesses of all kinds to do a reboot and recognize that the web is not just important for their business; it is a matter of survival. And it’s not about hiring a bunch of young people. I call it a Digital Attitude, and I have seen firsthand how difficult it can be for individuals who weren’t “born with it” to make this paradigm shift. 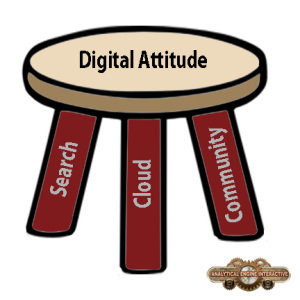 But the fact is that adopting a Digital Attitude has much less to do with when you were born and much more to do with your willingness and ability to shift your perspective, learn to use some new tools, and gain a working understanding of some basic pillars: imagine them as three legs of a stool. It’s hard to believe that as little as 25 years ago there was no such thing as “Search”. The closest we got was a visit to the local library where you would rifle through index cards marked up with the Dewey Decimal system to find a book. Search as a mental model for how we understand the organization of all the world’s information has impacted our lives profoundly. Understanding how Search works, how data, Meta data, and context come together to form what Tim Berners Lee called the “Semantic Web” is something I’ll cover in later posts. For now, the important thing to understand about the mental model of Search is that if you name your files well, you don’t need to worry so much about your filing system. And, the corollary of Search is that digital artifacts, if not named and indexed, are lost forever. “The Cloud” is not a cloud at all; it is a mass of servers where we can keep our media and files, access applications and software, and collaborate on document creation. The Cloud has meant that the way we think about our “stuff” is less about ownership and more about access, a phrase coined by Kevin Kelly, former editor of Wired magazine. And it impacts on our ideas of ownership in other ways as well: using the cloud (and by cloud I mean simple tools like Drop box for file storage and sharing, or Google Docs) is a gateway into being able to do very powerful collaborative work. When I saw my twelve year old using a Google doc to co-author a group project for her grade seven history class, I knew that it was time for me to learn. And the learning curve is not just around using the tool. Using the tool is easy, and we’ll cover that in a later post too, but the learning curve is also around the idea of co authorship. The Cloud is about sharing files, information and ideas and about embracing new ideas around collaboration. Jeremy Rifkin’s “The Empathic Civilization” is a great book. For the short version, check out this RSA Animate on YouTube. I urge you to watch the whole thing but at around 6:30 in, the narrator talks about how our empathy has historically been bounded by the limits of our communications technologies, and that is the key idea that forms this third leg of the three-legged stool of Digital Attitude. Think about it: when the best we could do was shout, our community: that group of other folks for which we felt kinship and connection, was only as big as our voice could carry, it was our family. Fast forward to the Internet, where we can find like-minded people anywhere in the world, where there is so much immediacy to the stories of folks in far flung locations and situations, it can start a revolution (Think the Arab Spring), we truly are a global community. Finding your community, and participating in community is the only way to really understand how powerful and rewarding it can be, and the only way to leverage the power of social media and social search for your business or personal brand. This article lists over 65 social networks, and there are so many more out there. Look for a community of like-minded people and, if you are seeking to get up to speed on community quickly and with the most social ROI, start with Linked In. This video answers a typical Linked In question, which is: should I accept every request I get to connect on Linked In? If you can understand and embrace these three basics of the new reality, the place where they all intersect is where you will begin to adopt your Digital Attitude. This info graphic is a bit of a Digital Attitude “Coles Notes” that summarizes the vocabulary and concepts we’ll explore as we dig deeper into what it takes to Go Digital.